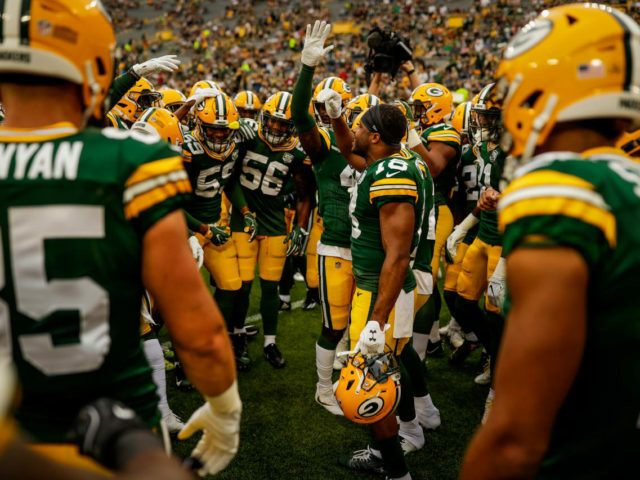 Now that we’re at the halfway point of the preseason, the Packers roster hierarchy is starting to take shape, and with it, a roster projection. And, when looking at the 2018 Packers roster, it’s not hard to see that they have well over 65 players who are worthy of making an NFL roster. Cutting down from 90 to 53 was unbelievable difficult and some very good players had to be released. In this projection, we’ll take a look at a prediction of the Opening Day 53-man roster as well as the Practice Squad. This one was pretty easy. With the amount of improvement both Kizer and Hundley have shown in Camp and throughout the first two preseason games, they’re both pretty much locked into the roster. The only exception would be if Hundley were to be a piece in a trade, but that’s unlikely after last year’s performance still in people’s minds. Tim Boyle is a talented prospect who needs a lot of work on his intermediate throws and a great candidate for the Practice Squad. A risky proposition is to keep only two true running backs for the first two games of the season, especially when one of them is the injury-prone Montgomery. But the rest of the roster is too deep to justify keeping a back like Devante Mays on the active roster when he hasn’t played in a game this year yet. That’s part of why Ripkowski is still on the squad. He can be the third running back until Jones returns, but then his roster spot is in jeopardy. Mays hopefully will take a spot on the Practice Squad. Keeping seven receivers isn’t the most ideal situation, but all seven have shown that they belong on an NFL roster. Even DeAngelo Yancey has taken enough steps to warrant consideration, but he’s stuck in the numbers game and spends another year on the Practice Squad. A notable missing name is Trevor Davis, who can’t shake an injury in Camp and brings little besides his return ability. With guys like Montgomery, Cobb, Quentin Rollins and others able to take those roles, Davis’s hold on a roster spot is on thin ice and it’s hard to see him making the team unless Ron Zook threatens somebody to keep him on the active roster. Coming into the Pittsburgh game, Lance Kendricks was all set to be the most notable cut in Camp this year, but then he showed the versatility and skill that made him a rare Ted Thompson signing last year. With his ability to line up in-line, out wide, and in the backfield, Kendricks blend of skills is a great third option to have behind the extreme receiving skill of Graham and the well-round Lewis. Unfortunately, that leaves no room for Robert Tonyan, who has shown some Graham-like ability in the passing game. He’s a prime candidate for the Practice Squad who can easily grab a spot later this year or in 2019. The starting five is pretty much locked in unless Justin McCray suddenly regresses in play. Behind them, depth concerns are very real. Spriggs and Murphy show flashes but are inconsistent and were consistently lined up on the opposite sides of where they should’ve been all Camp. But they can hold down the fort for a game if needed. Patrick has been solid as well as a backup, but Day has been quite the find off the waiver wire last year. He has been a standout in the preseason and might have found a home as the backup center. One notable cut was Byron Bell, whose versatility is good, but his lack of agility is a detriment for the offensive system. These five have been locked into the roster for months, and they’ve all only gotten better during Camp. The starting group is as good as it gets in the NFC for a three man front, while Lowry showed last year that he can be a capable, high-effort starter at the NFL level. The real find so far this year has been Adams, who has at times been unblockable. His ability to split double teams and swim by opposing linemen will help on third downs greatly this year. James Looney was a close pick to make it as well, but needs at other positions move him to the practice squad, the only drafted player to be cut. I didn’t want to cut Greer Martini or Chris Odom. It hurt deeply to see them on the Practice Squad list. But they haven’t jumped over the current nine on the roster. The starters all are good to very good players who will be impactful pieces to Mike Pettine’s defense. On the bench, Gilbert is the perfect third edge rusher who can give Perry and Matthews a break. Biegel and Fackrell are both more versatile that they’ve been given a chance to be and should be able to line up inside and outside, especially Fackrell, who’d be an asset in coverage instead of as a pass rusher. Ahmad Thomas has locked himself into a spot to replace Joe Thomas with his performances the first two preseason games, and Donnerson’s combination of athleticism and tenacity is something that should make him a Special Teams stalwart. I give Quinten Rollins a half position here since he’ll likely be a hybrid cornerback/safety. After a disastrous week against Tennessee, he was much better against the Steelers, both on defense and as a punt returner. He looked a lot more natural on special teams, which helps him grab a spot over Josh Hawkins, who was my final cut and doesn’t have any practice squad eligibility left. The real battle will be for the fourth corner spot, where Josh Jackson and Davon House are both having strong Camps. Lenzy Pipkins provides special teams value and can play the perimeter if injuries strike. A group that has been the focus of a lot of fire and brimstone comments from the fanbase after the Pittsburgh game, there is a still a lot of talent here and I have no doubt that they’ll be ready for the season. The preseason is meant to weed out mistakes and get back into form to be ready for the season. Clinton-Dix is one of the leaders of the defense and is locked into a spot. Brice and Jones are still battling for the other safety role, but it would be better if Jones could step up and seize the job. He’s too talented to sit the bench. Evans brings special teams value and Rollins can be a Micah Hyde-lite. Crosby and Scott have no competition and are set to be the kickers for the forseeable future. The battle is at long snapper, where Zach Triner and Bradley are in a tight battle. Neither has had any big mistakes and Bradley’s history of consistency in college give him the edge to be the guy who may finally remove Brett Goode from Brian Gutekunst’s speed dial. This entry was posted in Authors, Mike Wendlandt, Packers 2018-2019 Season, Seasons and tagged 2018 Season, Green Bay Packers, Roster Prediction, training camp. Bookmark the permalink. There will probably be one or two players from other teams cuts that make the GB practice squad. Would prefer they try to trade Hundley but I do realize he has little value on the market. Little difference between Hundley and Kizer presently and I do expect Kizer to surpass him during the season. When players like Brett Hundley, Kyler Fackrell, Jason Spriggs, Ty Montgomery, Lance Kendricks and Quinten Rollins are making your final roster, it shows you don’t have much quality depth on your roster. Rare for me to comment. But it’s also rare to see such reasoned and complete explanations in an article on any subject so thanks for that. By the way, I see one of the new RB pick-ups making the roster just to be safe.